WHERE – Wherever you are – anytime during those 8 days. THE INTENTION – For people from all over the globe to spread vibrations and energy of peace, love and Oneness to everyone & everything on the planet (and beyond). ACT Locally ~ ImpACT Globally ~ this is a cost free event! Have a get-together at home, in a park, block party, etc… to drum, dance, etc. Be creative and participate in ANY way you choose. After your event, please post your pictures on FB so we can share with others. WHY – Music (and therefore, rhythm) is a universal language. We all respond to the vibrations, rhythms and melodies whether we understand the words, or not. No matter whether or not someone thinks they have rhythm, the fact is that if you just feel your pulse you realize that everyone has an inner-percussionist. If you have a heart-beat you can drum, shake, dance, etc. Globally, as we join from different parts of the world, in different time zones, even though we won’t “know” it we will FEEL it as our rhythms become one.- knowing that there are others playing/dancing at the same time – which will serve to make us feel even more connected. Remember wherever you go and whatever you do – set an intention at the beginning that this is a safe place – a mistake-free zone. There is no right or wrong–there is only the intention of getting the positive vibrations out through different types of rhythm & feeling our connectedness and our Oneness. When you sign up, please indicate your city, state/province and country and whether you wish to invite others to your Circle event. If you’re participating individually or it is a more intimate gathering, please just write in your post how many people are participating around the world. After your event please send pictures of yourself or your group participating so we can make a compilation to share with other teammates. Last year, we had several thousand people participate from approximately 63 countries (and 43 states & Washington, D.C. in the US) represented. Let’s see if we can at least DOUBLE that, this year. 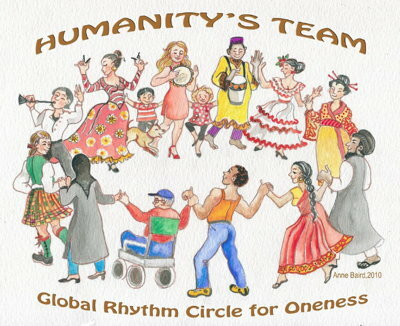 Wouldn’t it be ONEDERFUL to participate in the World’s Largest Rhythm Circle – with the intention of feeling our connectedness – during this Global Oneness Day celebration?